The blue and gold macaw (Ara ararauna) is a large parrot native to parts of Central and South America. Wild blue and gold macaws can be found in countries such as Ecuador, Panama, Colombia and Peru. Human activity (e.g. 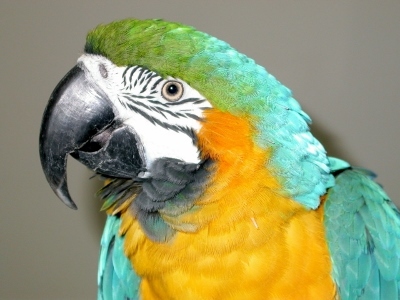 capture for the pet trade) has driven blue and gold macaws to extinction in Trinidad and Tobago. In the wild, blue and gold macaws live in lowland areas, including rainforests, swamps, wooded areas and savannas. Blue and gold macaws are among the larger macaws, with adults growing to a length of between 30 – 34 inches (76 – 86 cm). Blue and gold macaws are also commonly known as blue and yellow macaws. It’s no secret how blue and gold macaws got their name based on their colouring, which is primarily blue and gold/yellow. Both female and male blue and gold macaws have bright blue on their heads, upper necks, wings, tails and backs. Blue and gold macaws have yellow-gold plumage on their bellies and the undersides of their wings and tails. Blue and gold macaws also have a green forehead, a white face with fine stripes of black feathers and a black throat. Blue and gold macaws have a large black beak, which is perfect for crushing seeds and nuts. Blue and gold macaws have a joint between their upper beak and skull that allows their beaks more up and down movement. The extra movement allows blue and gold macaws to have more crushing power with their beaks. Blue and gold macaws can also use their beaks to help them climb. Blue and gold macaws are smart birds and will loudly squawk and scream to communicate. Loud squawking is part of blue and gold macaws’ natural behaviour. It cannot be trained away. Blue and gold macaws can talk and repeat easy words and short phrases. Blue and gold macaws are monogamous and usually mate for life. During breeding season, the female blue and gold macaw will incubate the eggs while the male brings food back to the nest. Blue and gold macaws typically breed during the first half of the year – January through July. As social birds, blue and gold macaws are often seen in the wild in pairs or groups of up to 30 birds. In captivity, blue and gold macaws need daily interaction with their caregivers and bird-safe toys to prevent boredom. Blue and gold macaws have a very long lifespan and can live more than 70 years with good care.